Want great, natural looking hair extensions that turns heads everywhere you go? Gold salon’s extensions are the highest quality human hair extensions available, why not drop by for a chat about our extensions and how they might make a difference to how your hair looks. 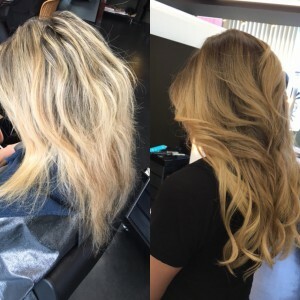 Thicker hair, Longer hair or non damaging colour change, extensions can be used in so many different ways for an effect personalized to your tastes and desires. Before /After created by Hiro, certified extension specialist.